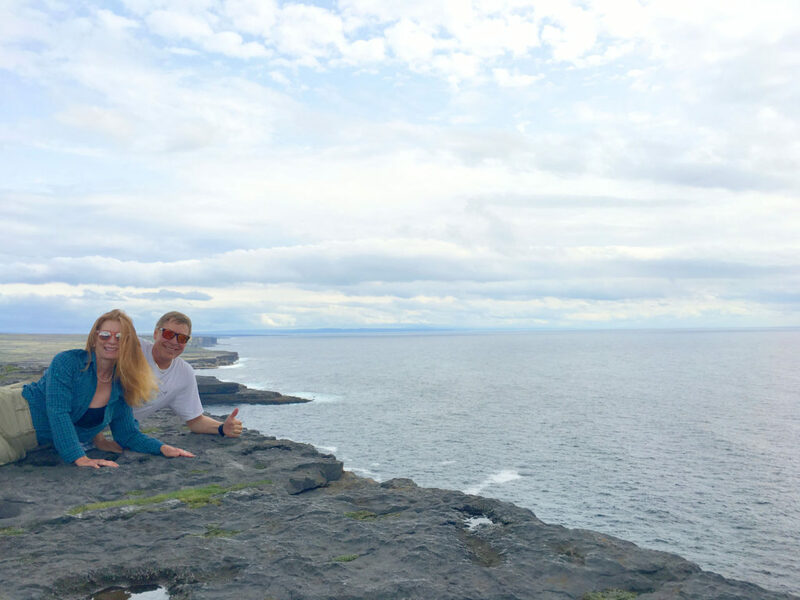 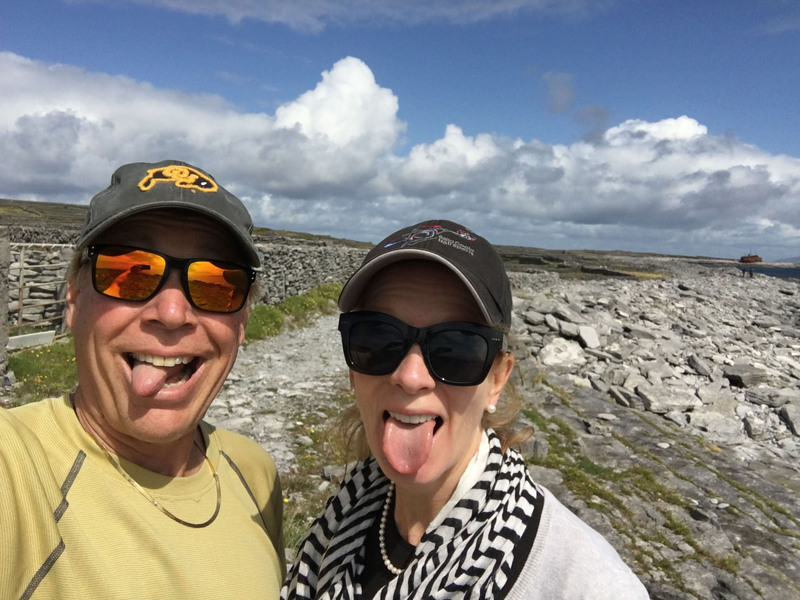 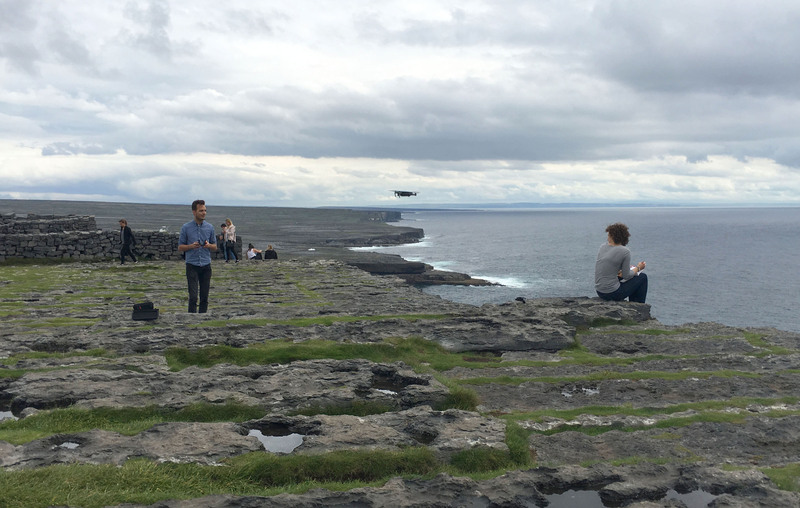 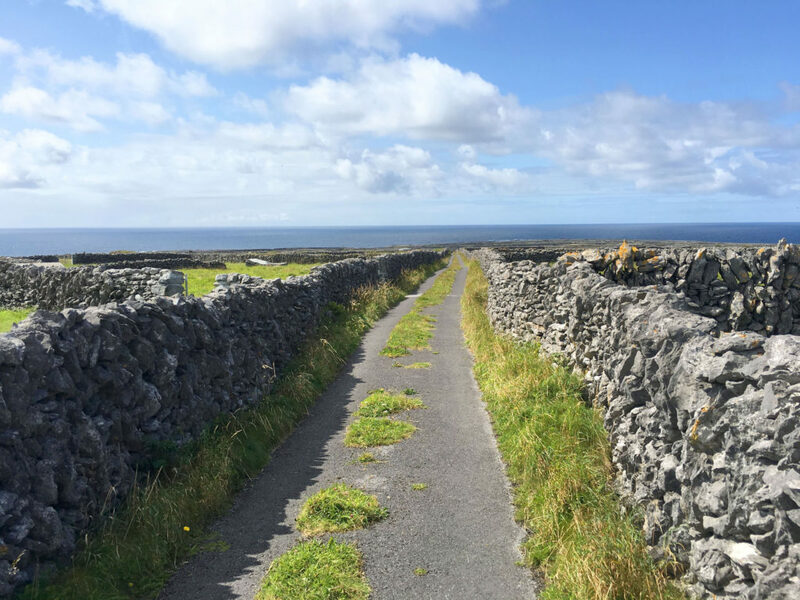 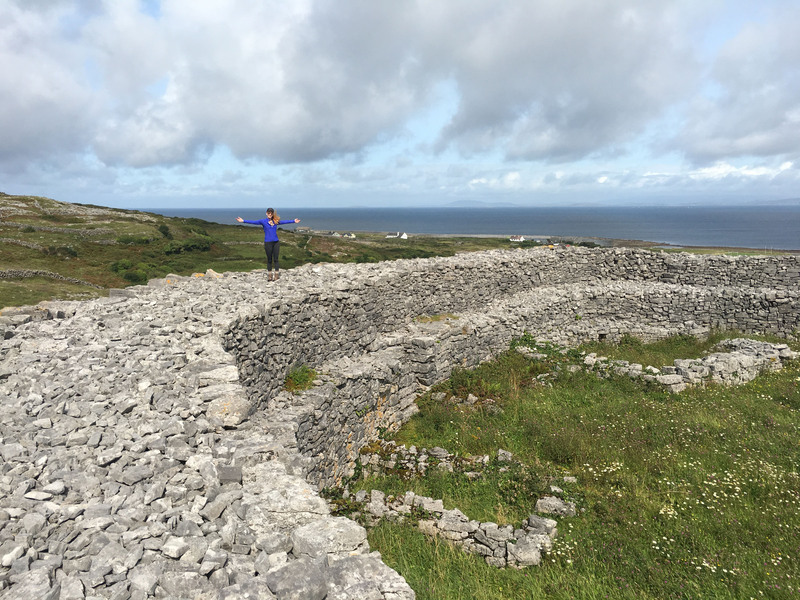 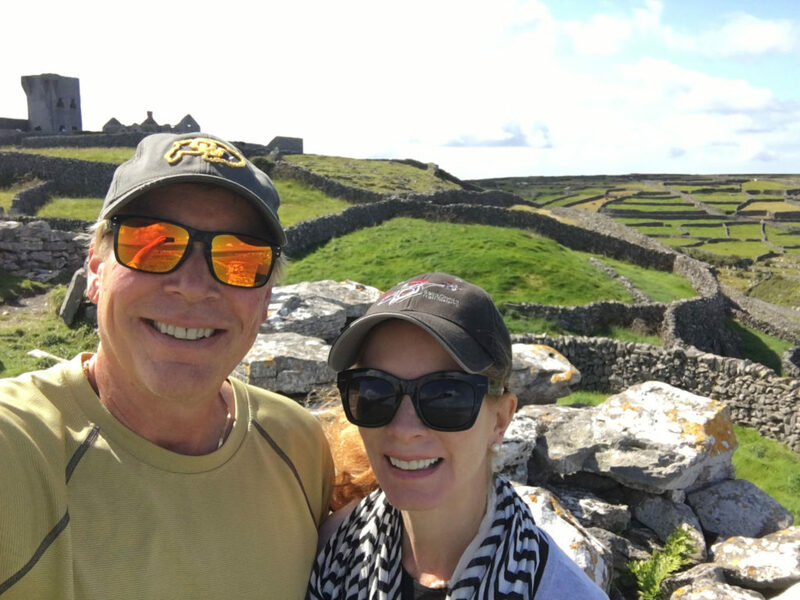 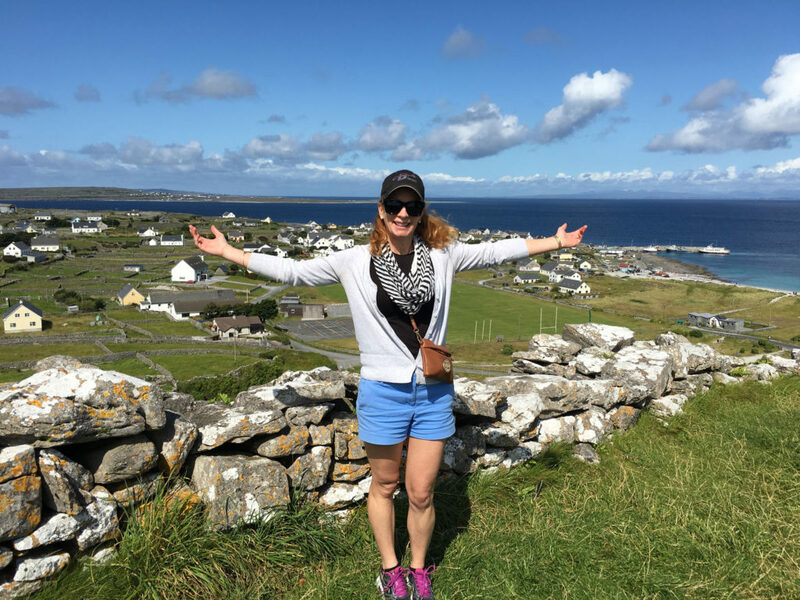 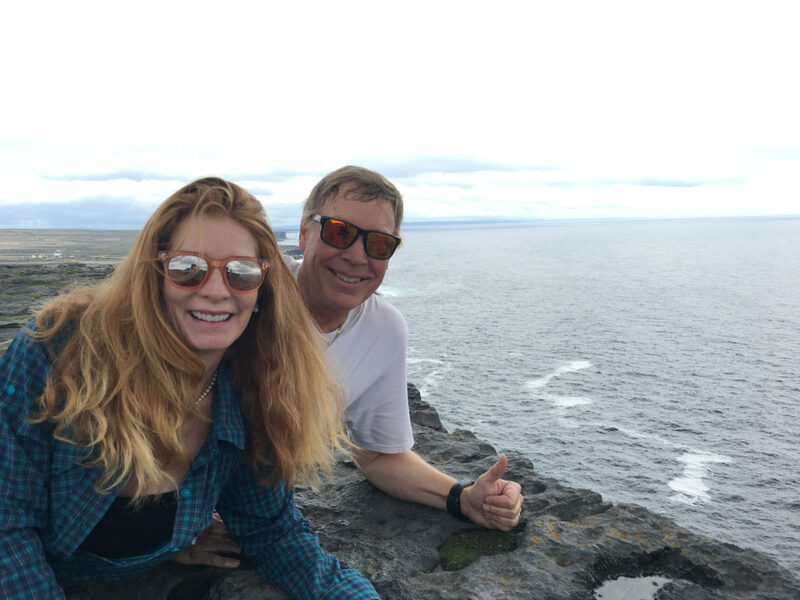 Visiting Ireland, you owe it yourself to go to the Aran Islands. 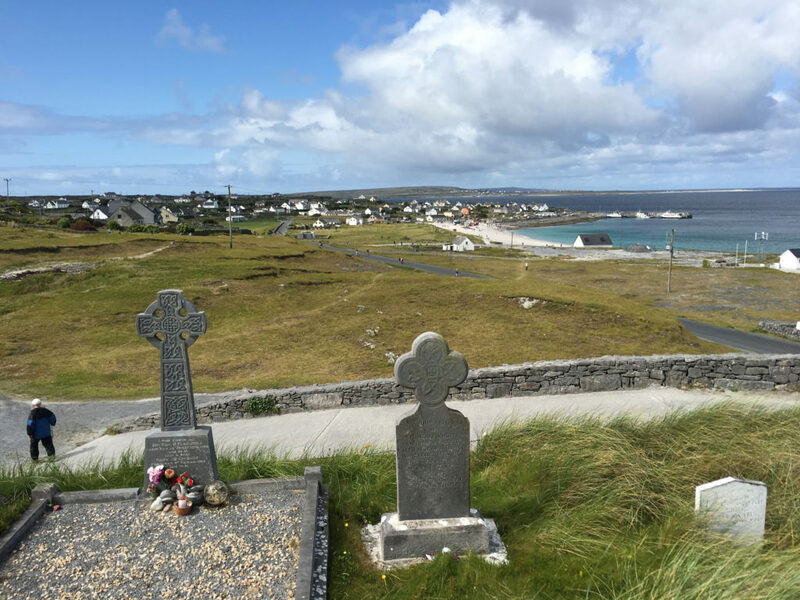 Yes, we are aware Ireland is an Island, hence the Emerald Isle name… but the West Coast Islands of Connemara are a must vacation destination. 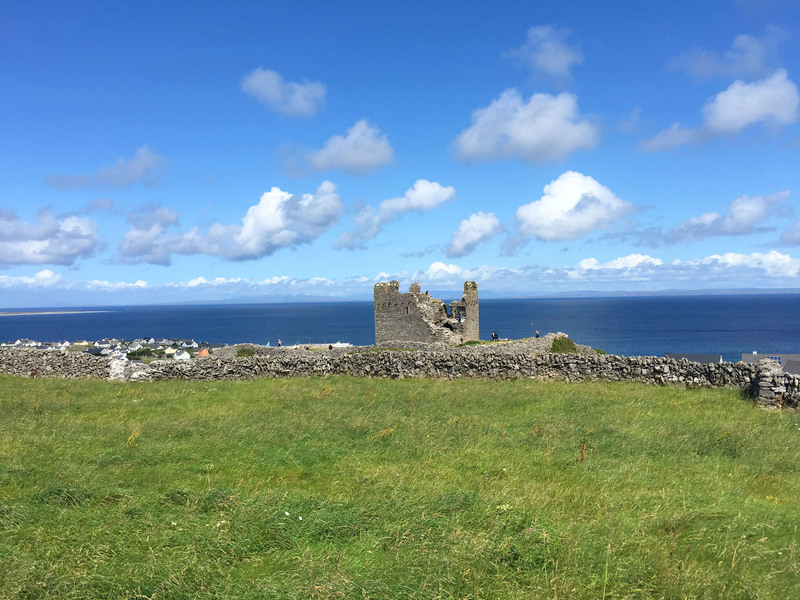 The island weather is better than the west coast, life moves more slowly on island, and these naturally beautiful islands are incredibly historic and easy to tour on bike, or to walk or hike, reached by ferry. The island people are welcoming and authentic as well. 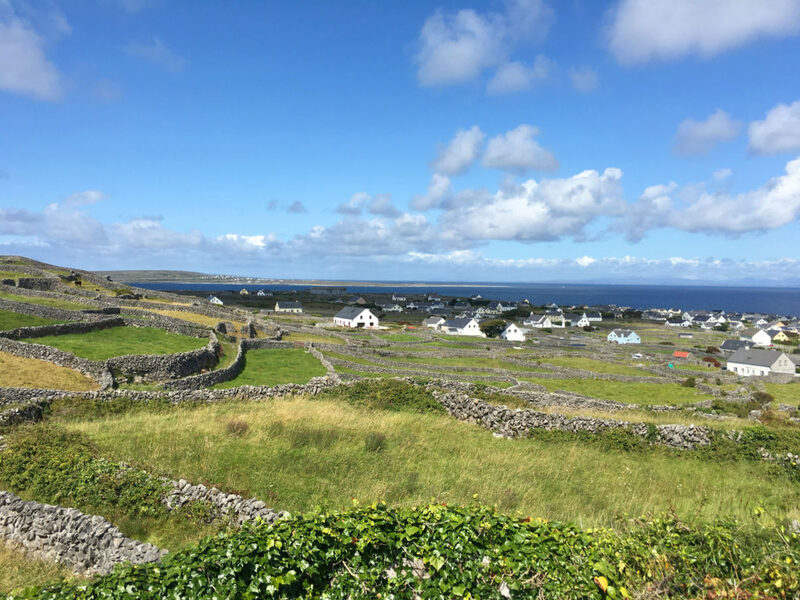 Inis Oirr, pronounced and also called Inisheer, is the smallest of the three Aran Islands, which include Inis Mor – the biggest, and Inis Meain – the middle. 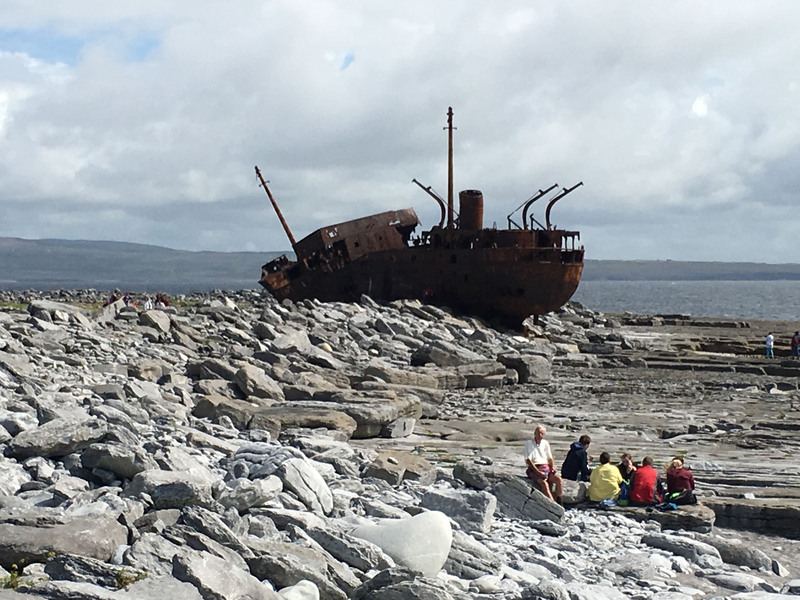 Inis Oirr is gorgeous beyond its 5km round size, with 3,000-miles of a-maze-ing stone walls, two towering castle ruins – including O’Brien’s 15th century Castle, a lighthouse and a mesmerizing shipwreck. 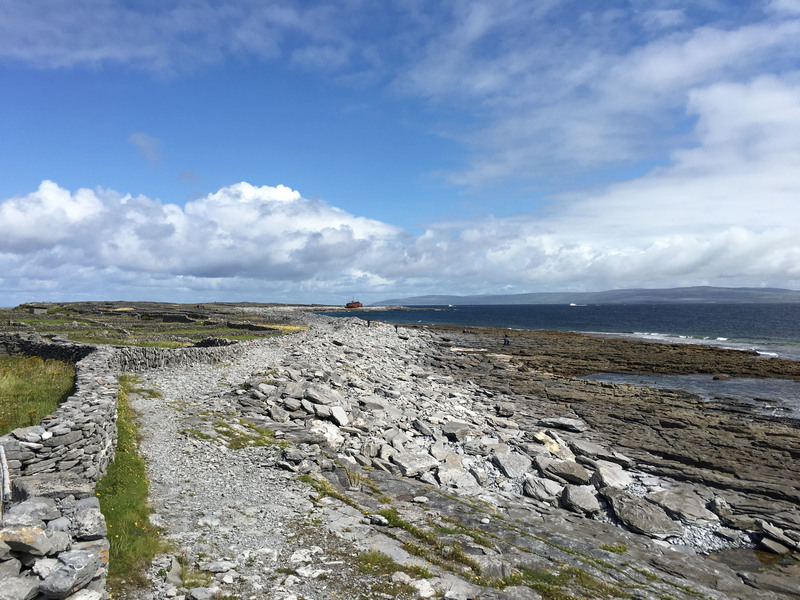 The views of the Cliffs of Moor across Galway Bay are brilliant. 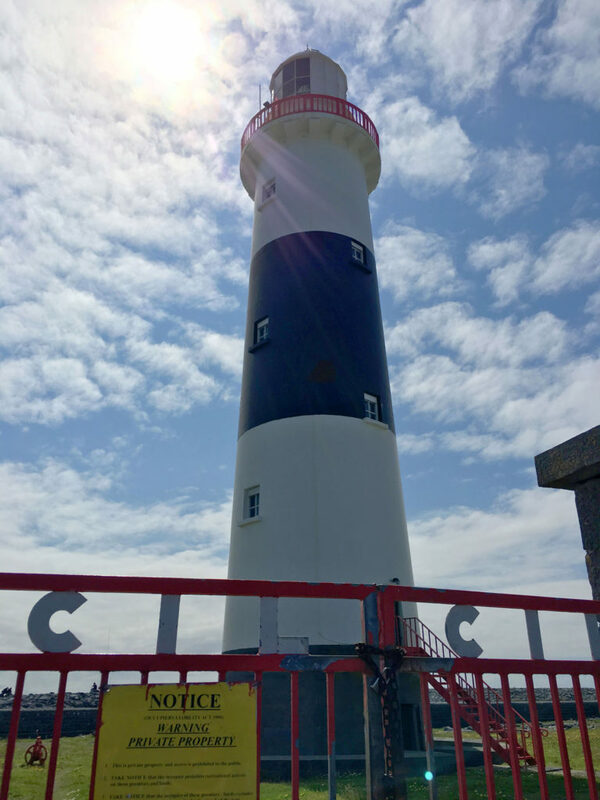 You can walk to these attractions, but it’s quite a distance. 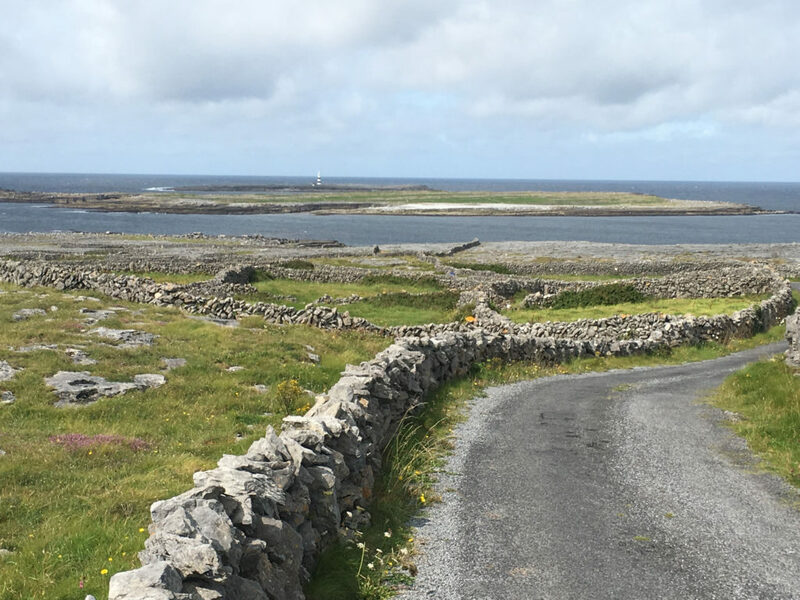 We suggest you hop on bikes ($10Eu a day from the ferry pier) and bike ahead of the rest of the Inisheer day trippers. 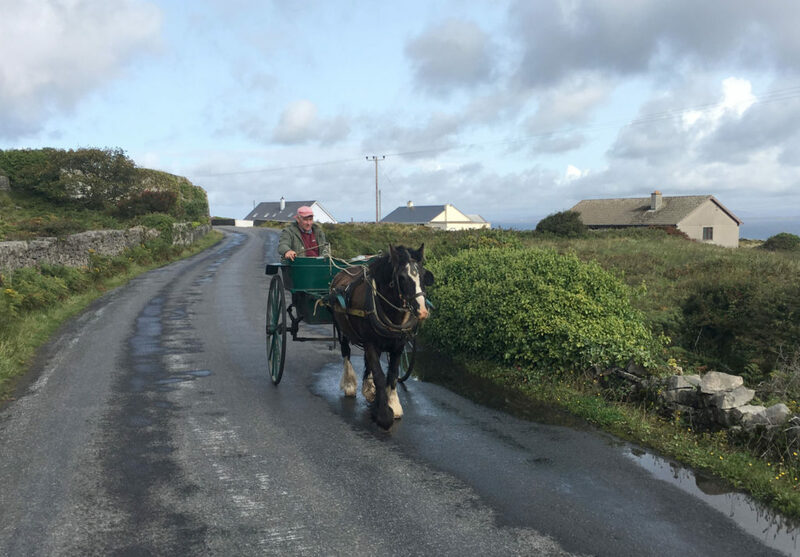 You could also take a horse drawn carriage – a romantic way to see the island the old- fashioned way with narration from your local carriage driver. 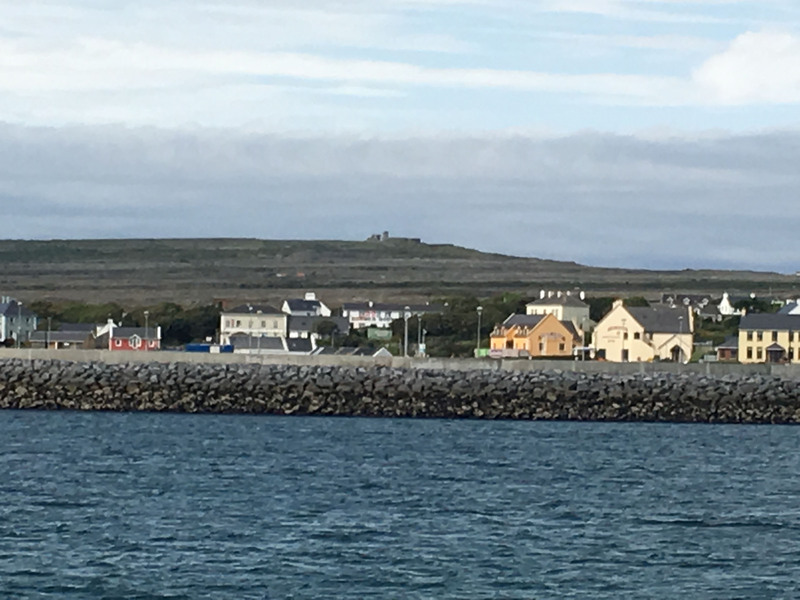 Return to Inis Oirr’s village to enjoy a pint and local seafood chowder with brown bread or a steaming pile of mussels with chips overlooking Galway Bay at one of the half dozen pubs. Buy an Aran Island Irish Sweater here, directly from the source off the backs of the grazing sheep you met on your tour. 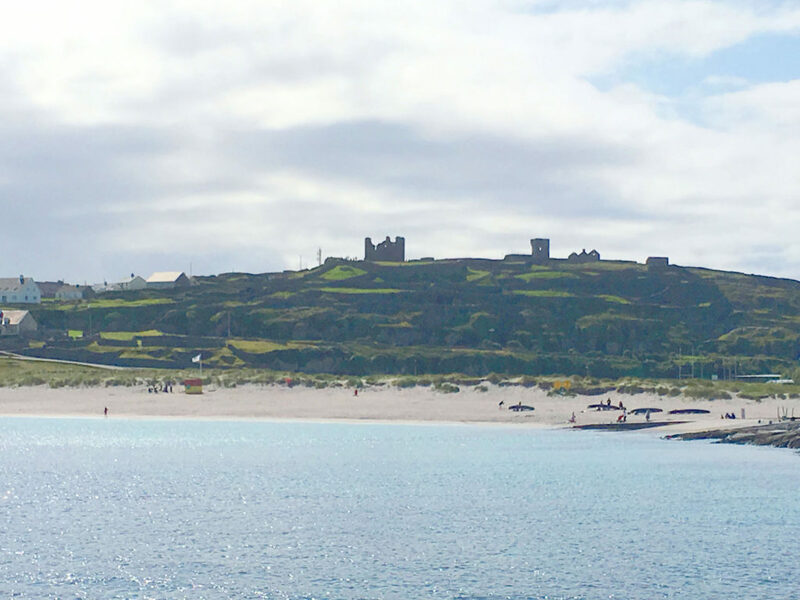 The ferry ride back provides great views of your day’s exploration. 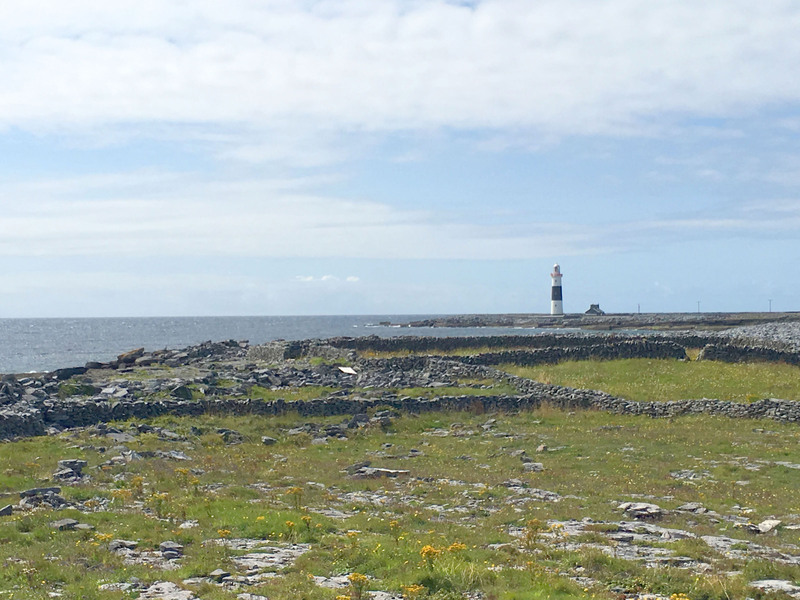 Inis Mor, Inishmore, is the largest of Aran Islands, and most populated (840 people). 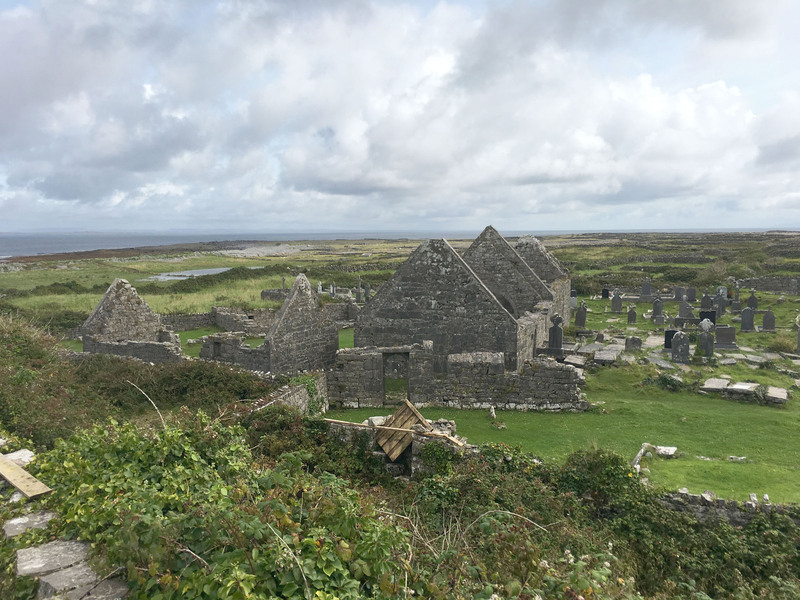 The Island of Saints and Scholars is incredibly scenic (and allegedly super spiritual) so make your pilgrimage here. 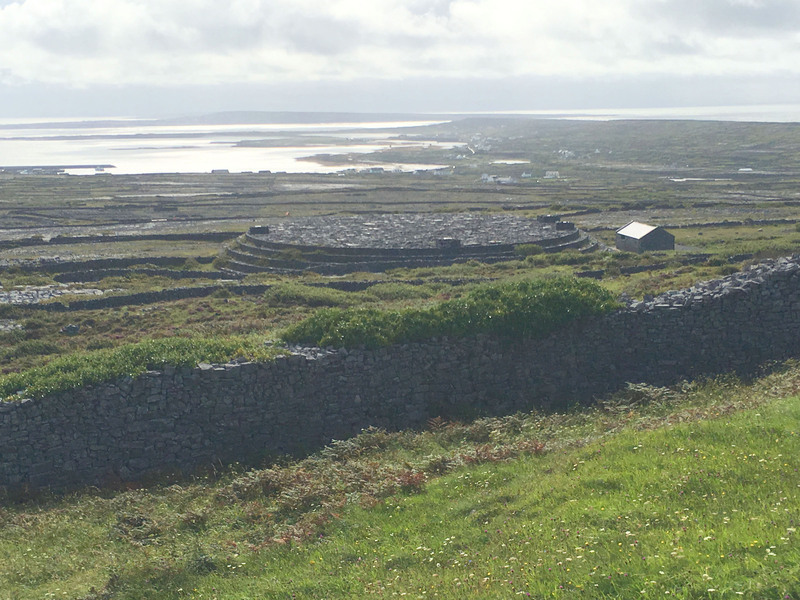 Inis Mor is topographically and architecturally spectacular, from 300-foot cliffs on the south western shores, where you will encounter the jaw-dropping Dun Aonghasa Fort – 1000 BC, to the dramatic naturally deep stone pool – the Worm Hole or Serpent’s Lair (where Red Bull films a crazy diving competition) and Black Fort. 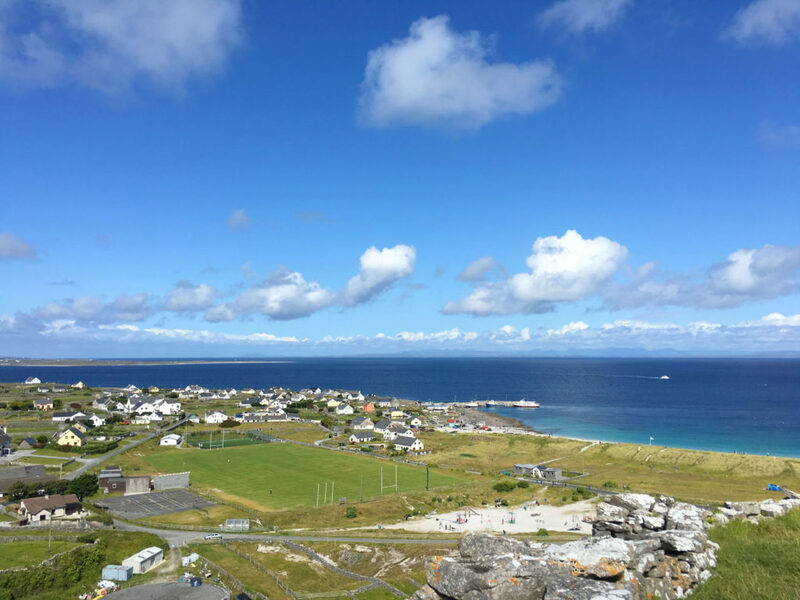 Along your tour or Inis Mor you will pass gorgeous green pastures and white sand beaches to the north and east. 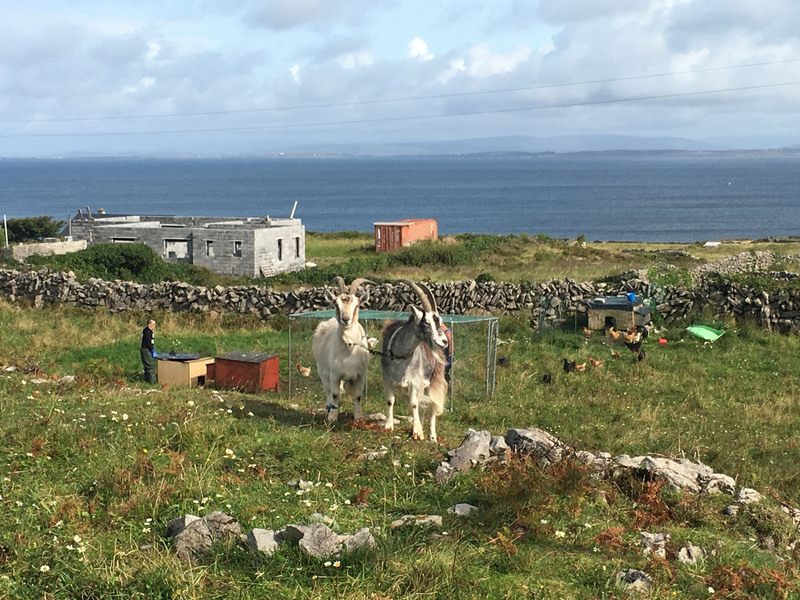 Don’t miss Inis Mor’s seal colony and the goat farm on the north east lower road on the shore. 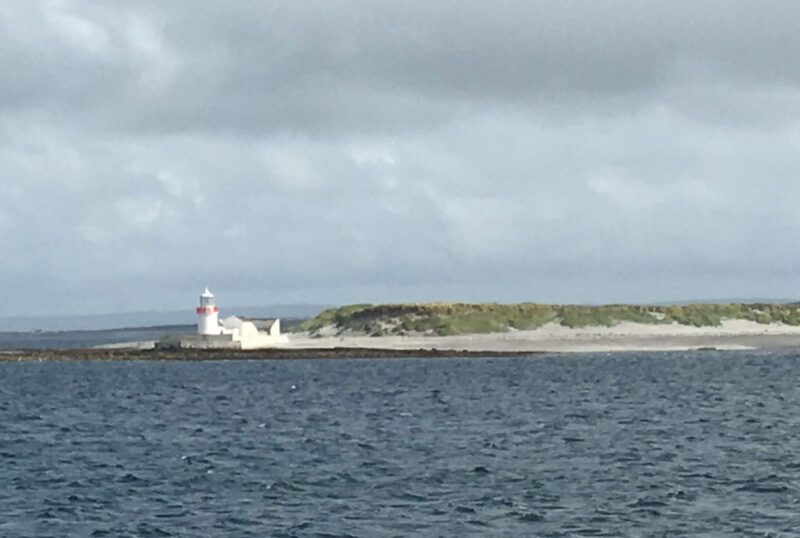 For the truly ambitious continue all the way out to the remote lighthouse, which is actually on an island. 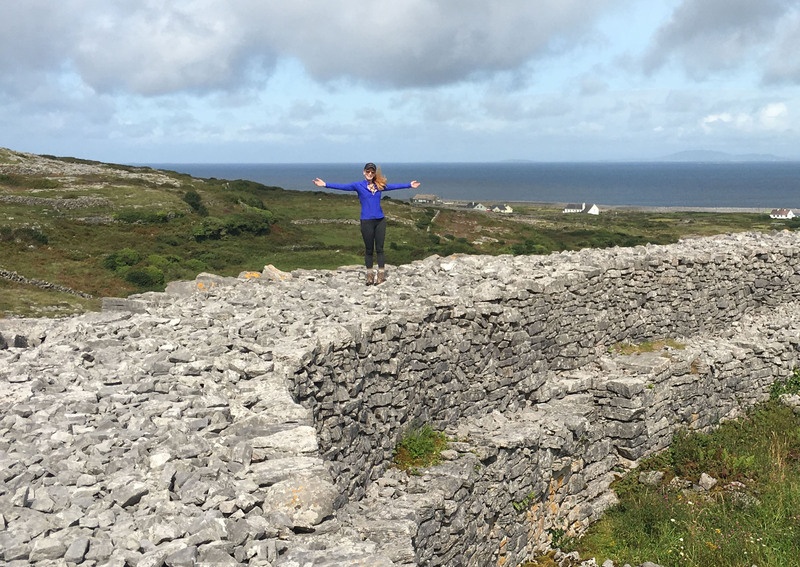 Inis Mor’s exhaustive stone construction dates to the Bronze Age, and is only upstaged by the towering cliffs crashing to the sea. 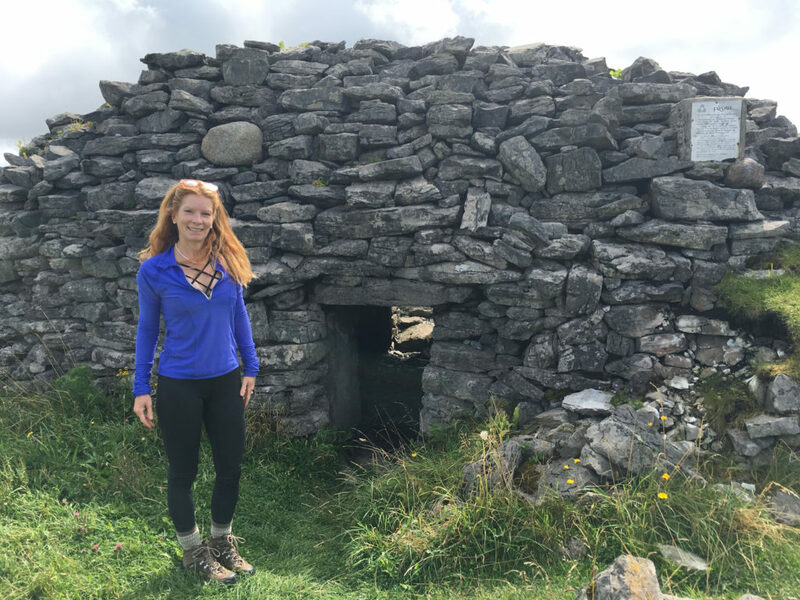 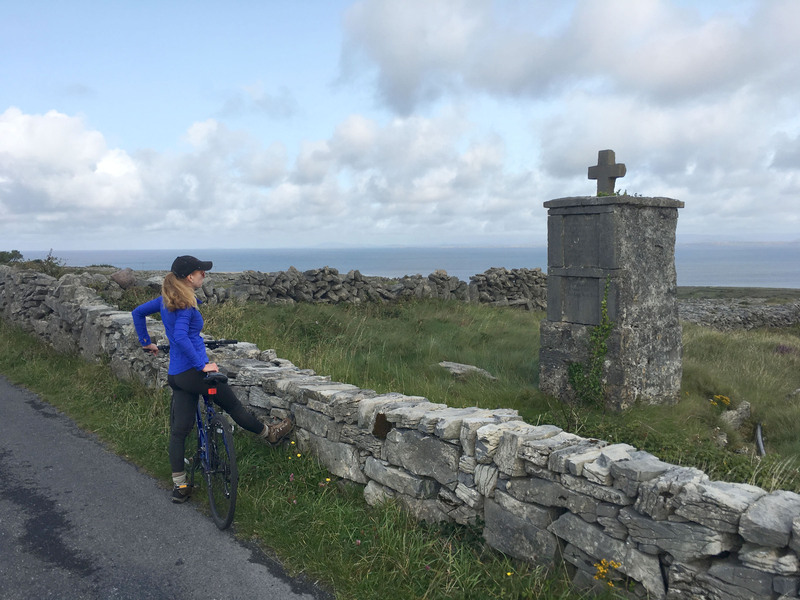 All over the island are stone monuments of mythic proportions- pre-Christian and Celtic crosses, seven ancient stone churches, castles and elaborate limestone walls, beautiful wild flowers, birds, goats and seals. 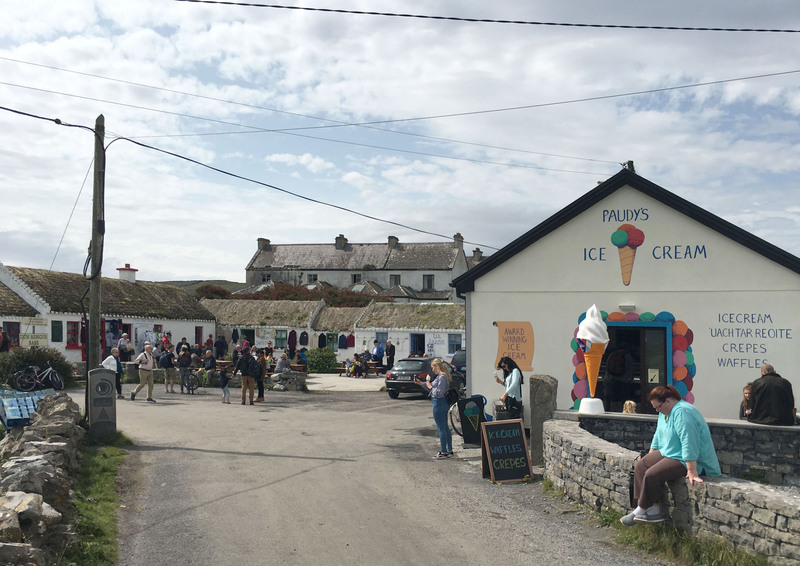 The ferry landing in Kilronan is home to several bnbs, pubs, Aran Isle sweater shops, bike rentals and two lovely sand beaches. 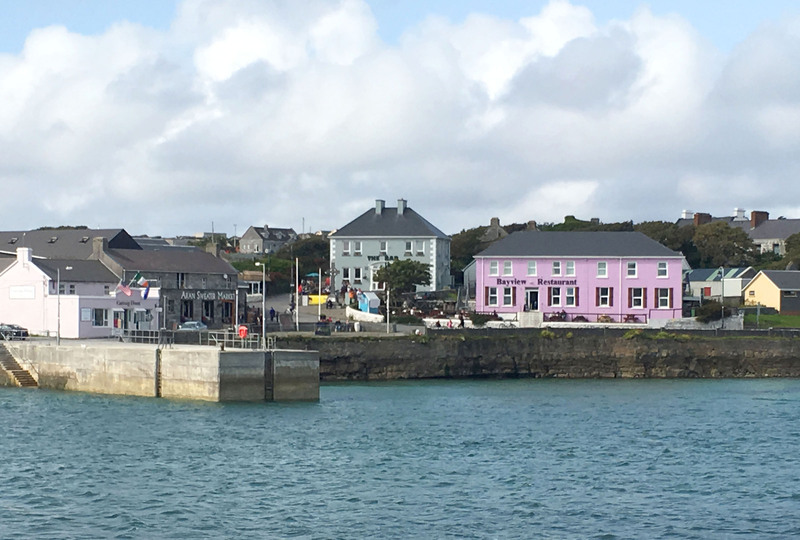 Our favorite Inismor watering hole is Joe Wattys Pub for yummy pub grub and Craic (live entertainment in the evening). 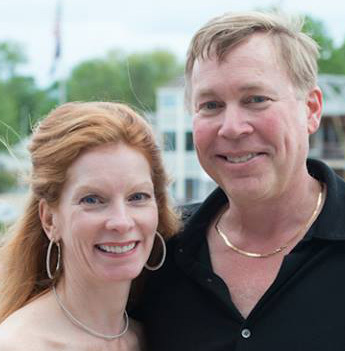 The bar, clever name right? 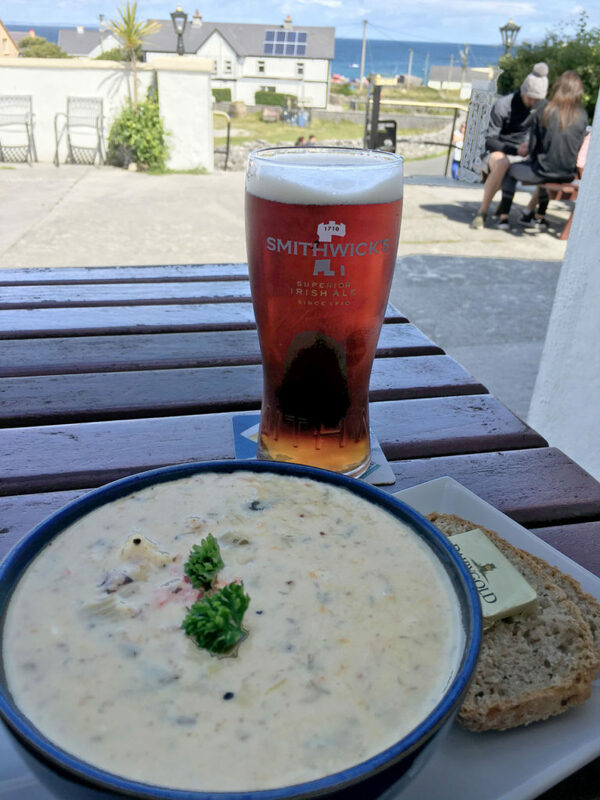 !, serves great fare for lunch, with a pint and a view of the harbor from the outdoor beer garden. 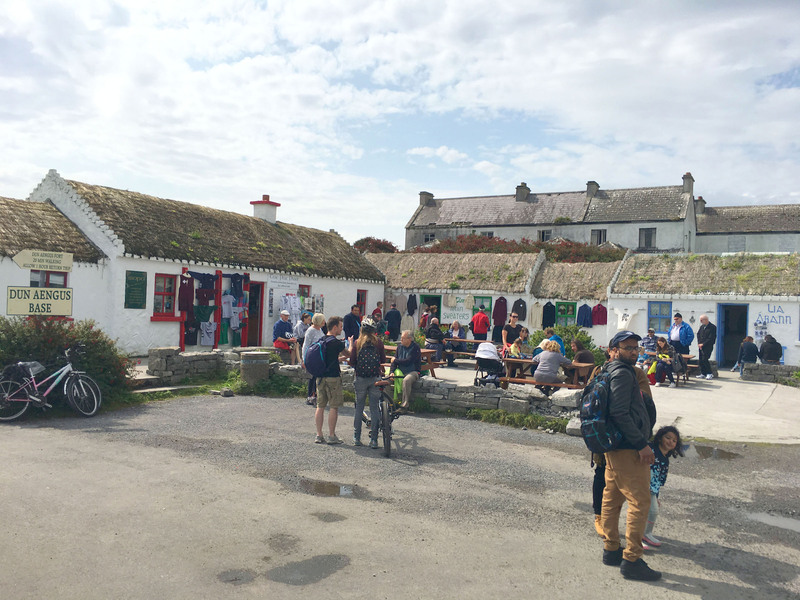 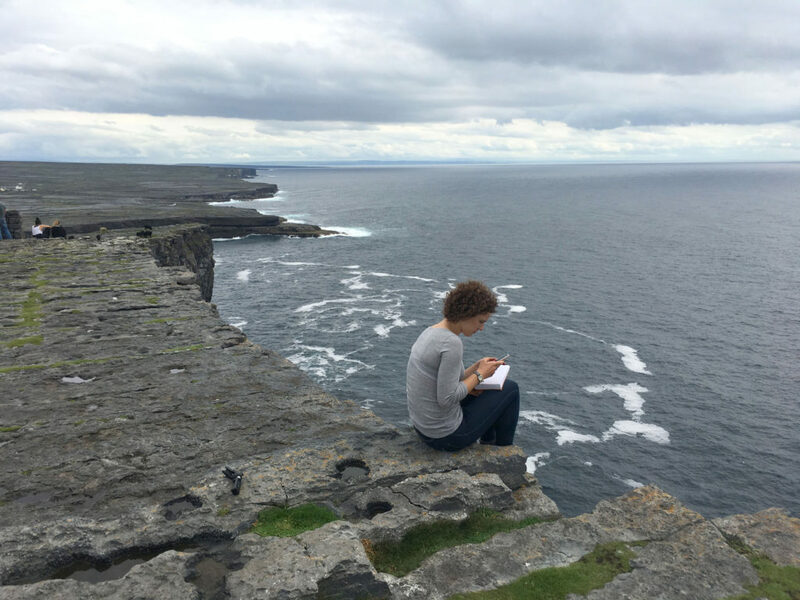 We suggest you stay the night on InisMor, to get “more inis”, and truly explore the 9-kilometer wide island by bike or hike, stopping for lunch of fresh crab at Nan Phaidi’s thatched cottage out by Dun Anonghasa. 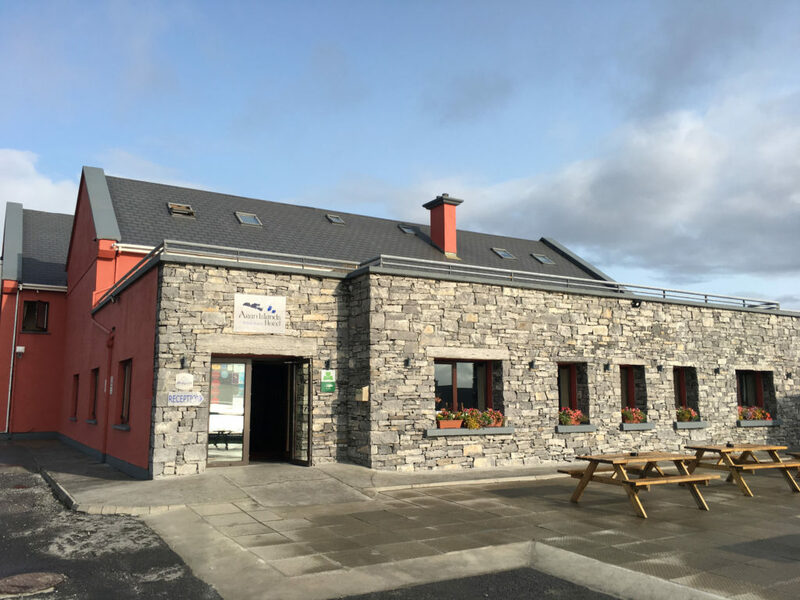 Stay at the lovely Aran Islands Hotel in town (its rather modern by island standards), ask for a room with a harbor view and 2nd floor balcony. 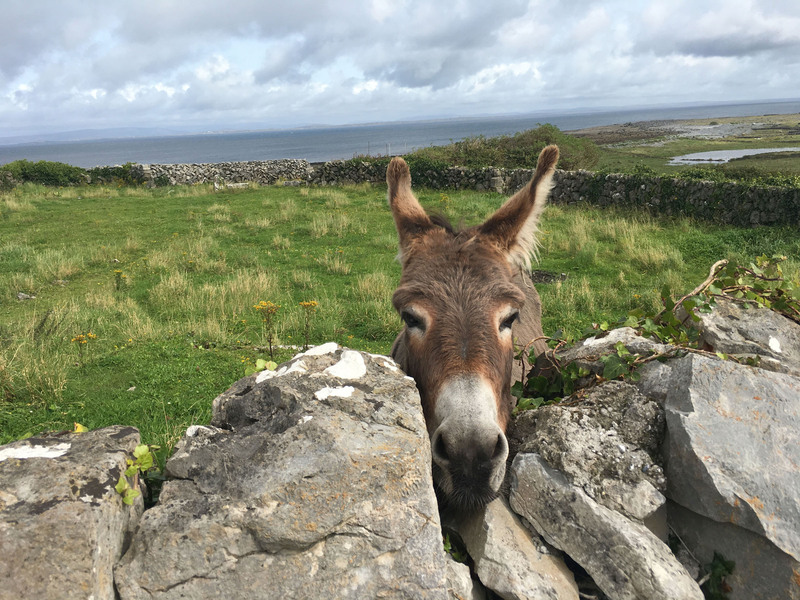 Reserve dinner at Joe Watty’s (call Grace ahead) and stay for the live Craic. Wake to the fresh island air, and explore more the following morning (ahead of the day’s visitors) before returning on an afternoon ferry. 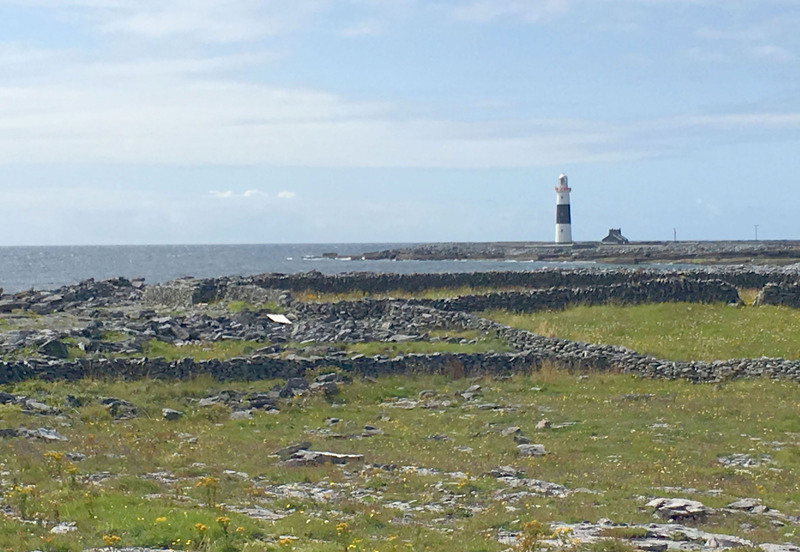 Visiting Inis Mor for the day, the Hop On Hop Off bus tour would be well played to see the dozen attractions, with quality walking shoes. 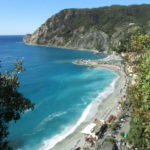 Or bike. 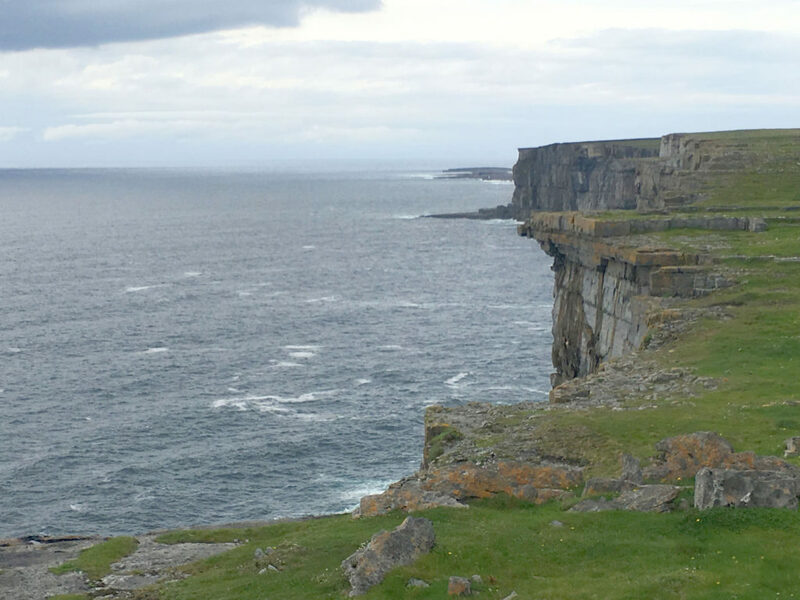 It’s a rugged spectacular isle, with 4,000 years of heritage and almost as many miles of intricate stone walls! 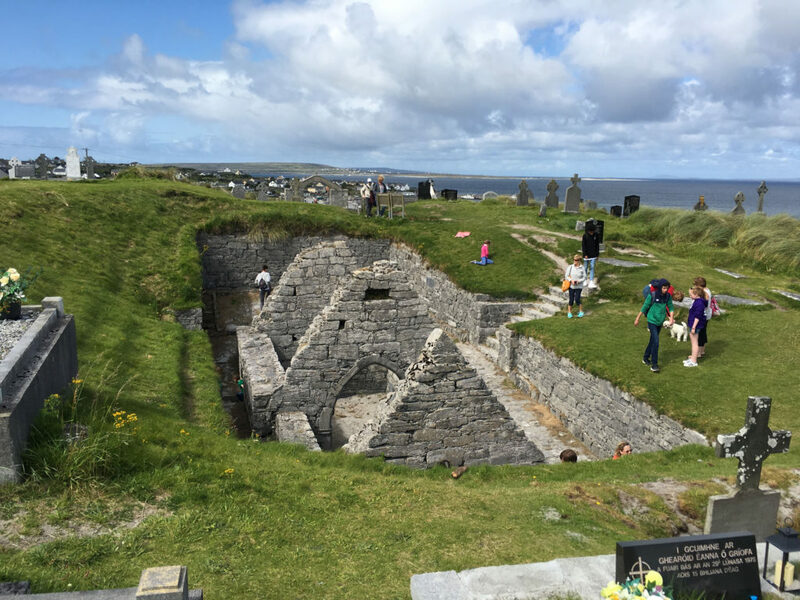 Visit Inishbofin and Clare Island for more Irish island adventure. 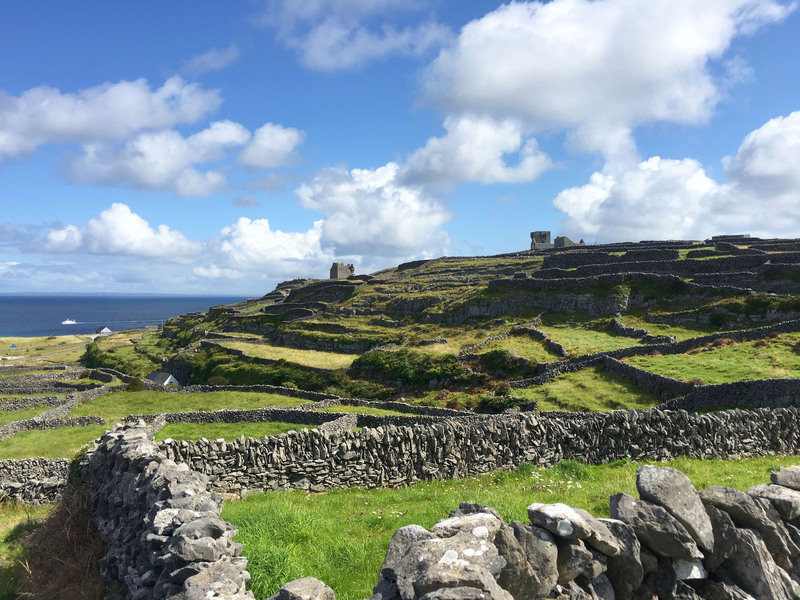 We have yet to explore all the islands in Ireland, let us know if you discover a magical Irish isle.